Swaffham Kidallsmill Farm post mill stood to the north east of the town on the west side of the Sporle Road. The mill stood on the site for at least 200 years, it was built over a roundhouse, with common sails and could well have used them all its working life, power being transmitted from them by a wooden windshaft and a wooden upright shaft to power French burr stones to grind wheat to flour, along with a flour mill and jumper. A single pair were in use in 1814 and two pairs by 1881, one pair being 4ft. 4ins. and the other pair 4ft. 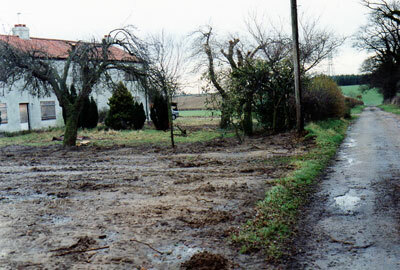 Lot V. A Piece of Land called the Seven Rood, lying in a Field called Sporle Field, near a Windmill. Lot 3. A Post Windmill with pair of stones, situate in Sporle Field, an acre and a half of arable land, cottage and substantial granary. Copyhold, fine certain. Enquire of Mr. Wright, Solr. Swaffham. Dated this 5th December 1866. To be Let with possession at Michaelmas next, a WIND MILL with two pairs of good French stones, flour mill and jumper, roundhouse (with new asphalte floor) capable of containing 70 quarters. Apply to Mr. Philo, London Street, Swaffham. Solictor to the said executor. The property of Mr. W. Newby, removed from Mrs. Kiddall's premises for convenience of sale. Comprising pair of capital French burr millstones, 4 ft. 4 ins., pair of ditto 4 ft., 2 stone nuts, oak upright shaft, ditto wind shaft, ditto cross beam, 2 stocks, quantity of oak posts, ditto waether boarding, oak and deal beams, large quantity of iron bolts and other iron, ditto deal firewood, iron anchors, holdfasts, drain pipes, sundry bricks, several lots of wood useful for building purposes and otjher effects. Offices, Athenaeum Chambers, Kings Lynn. Aa windmill that once stood just outside Swaffham in Norfolk. 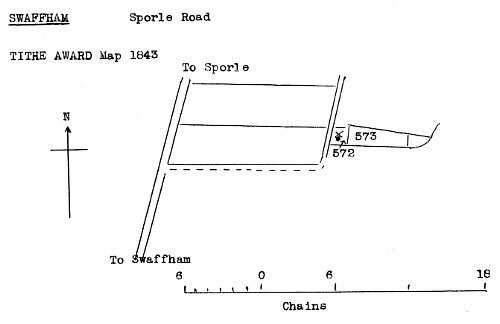 The site is on what is now called the old Sporle rd, it is an elevated position some 76 feet above sea level. I purchased a property there about 1990 called Mill Farm Cottages and was told at the time that it had once been a mill, as it was in such poor condition I demolished the building and erected a new one, the very large oak beams were some 12 inches square and it had obviously been altered over the years as a lot of the lower brickwork was of very thin bricks C.1700 and the top Victorian, it also appeared to have been on two levels at one time, a two story section and single story but the whole building had been rendered over at some time in the past. The only references I can find regarding it is a farm nearby in 1847 called Kidallsmill Farm and an early reference to it as "up by Powleys Mill" As is always the case at the time I was only mildly interested so did not inquire any further, even from some ladies who stopped to say they once lived there. 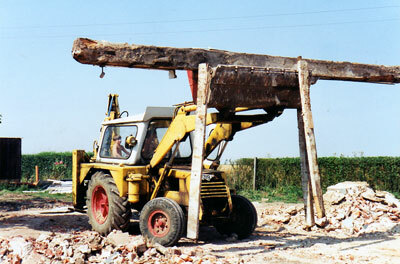 I have just come across some photos taken when I demolished the building. I have selected a few that may be of interest to you? 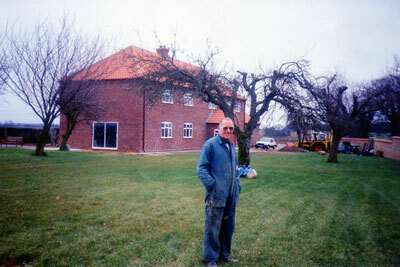 When I purchased it, it had been turned into two farm cottages, I am sure the the mill was on the left hand side as I removed some very large oak timbers and joists from that end and the top half had been built using Victorian bricks where as the rest of the building was built of very thin bricks circa at least 1700 maybe earlier. I believe the two small buildings on the left hand end were added as a washing room and toilet as there was also a very deep well at that end. 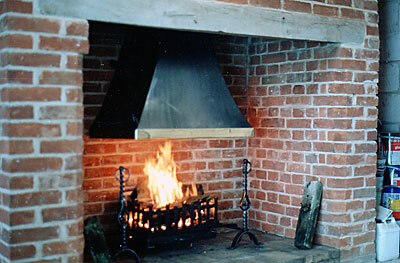 I used some of the Victorian bricks to build a fireplace in the hall, the oak lintel over the fireplace is one of the joists I reclaimed, also backing on to that a similar one in the front room. 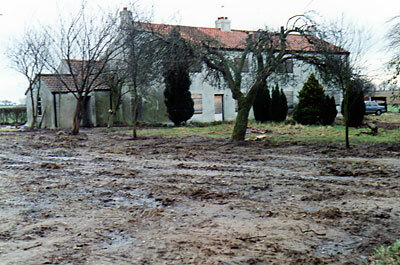 The new house is standing almost on the same footprint as the old building. All the old bricks and timbers were sold for reuse. White's 1864: William Kidall, corn miller & farmer, residing at Castleacre st.